Composting in New York City can be challenging to say the least. Not only are you dealing with the constant changing of the seasons, but space in this densely packed town is also sparse. However, with every challenge is also an opportunity, and much like many of the other problems associated with these limitations we look to design to keep us moving in the right direction. 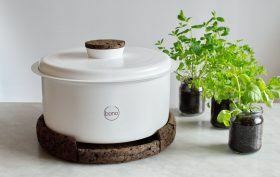 On the composting front Polish designer Ala Sieradzka‘s as made for us Bono, a compact countertop composter spun from powder-coated aluminum that comes with an equally stylish cork lid and base.